Vanaire Fume Scrubbers deliver outstanding performance and are guaranteed to be compliant with local, state, and federal regulations. Vanaire’s custom-designed packed-bed Fume Scrubbers are designed for the efficient removal of water-soluble contaminants using mechanical impingement or gas absorption processes. Each Vanaire Fume Scrubber is designed and manufactured according to your facility’s specific conditions and desired efficiency. Our Fume Scrubbers are available in horizontal (crossflow) or vertical (countercurrent) configurations, depending on your facility’s layout and space limitations. Vanaire Fume Scrubbers are constructed according to the highest industry standards and are guaranteed to function perfectly in extreme conditions. Maximum corrosion resistance is made possible with the use of PVC, solid fiberglass, filament-wound fiberglass, CPVC, and polypropylene. 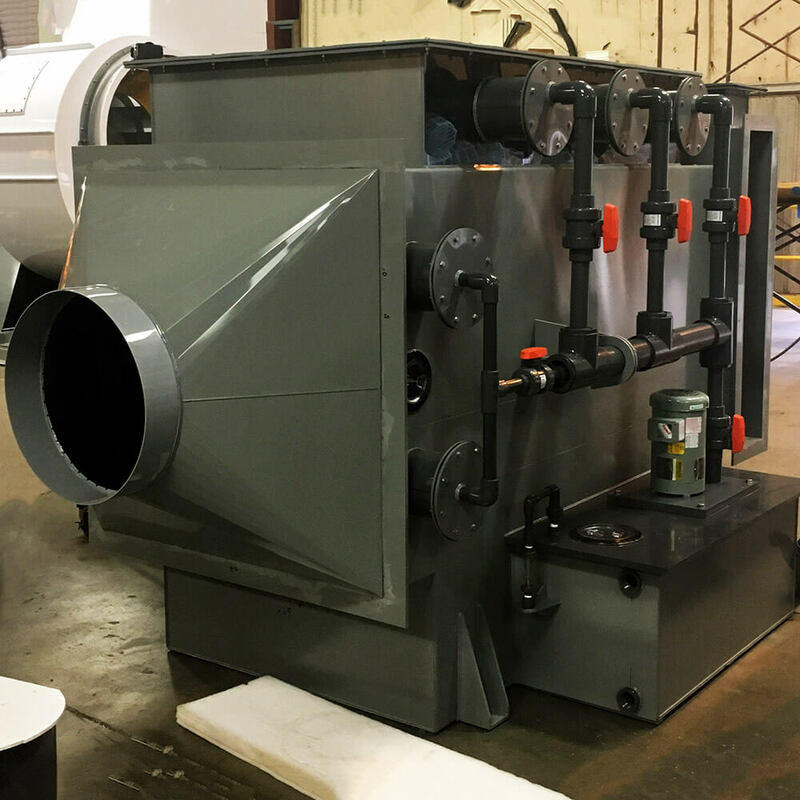 Contact the Vanaire team to request a quote for your custom Fume Scrubbers. Talk to our engineers to design and build a Fume Scrubber according to your layout and efficiency needs. Vanaire designs and manufactures high efficiency air scrubbers for surface and metal finishing processes. The fume scrubbers are smartly designed to provide absolute removal of hazardous gaseous pollutants. 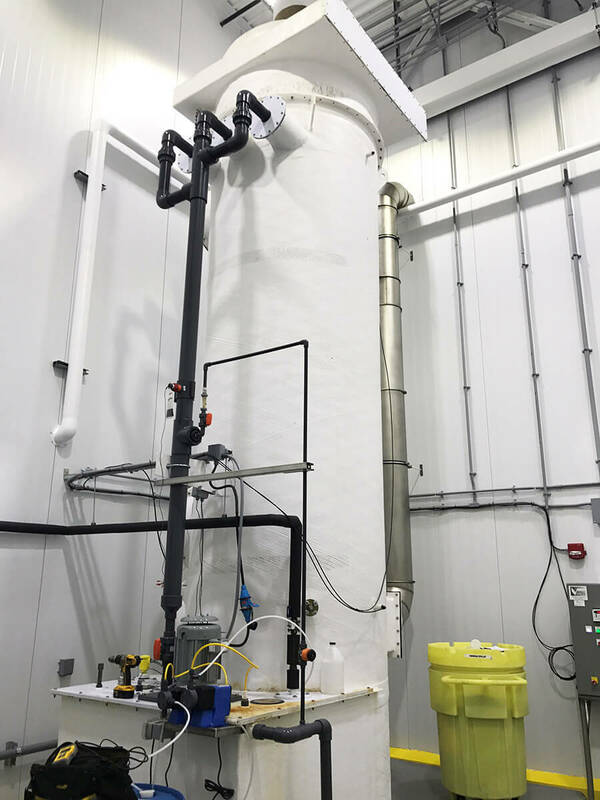 Vanaire has an incredible expertise in manufacturing corrosion resistant, custom-built air scrubbers that bring an exceptional accuracy in removing toxic gaseous pollutants. Currently, our company is one of the leading providers of highly efficient air scrubbing systems for surface and metal finishing industry. We happily supply the manufacturers from the industry with versatile scrubbers that can be built in sizes up to 60,000 CFM. Vanaire designs and fabricates Horizontal Crossflow Scrubbers for a wide range of industrial applications. 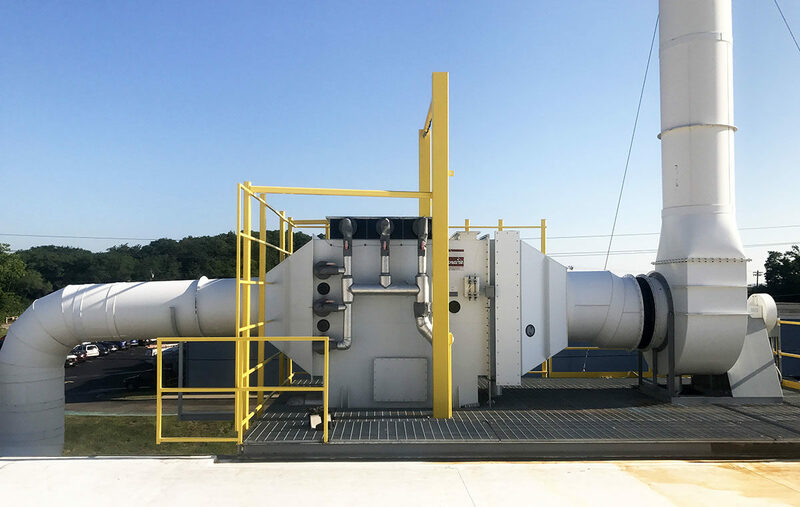 With more than 30 years of experience in the air pollution control industry, our Crossflow Scrubbers are the ideal solution for the safe and efficient capture and removal of gaseous pollutants from the air. Horizontal Crossflow Air Scrubbers are typically used in the metal finishing industry, where facilities usually have limited space and low inlet loadings. 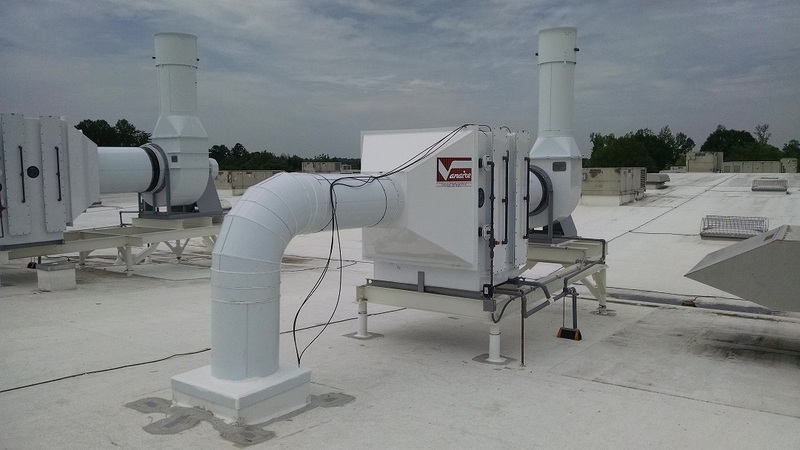 If this is the case for your organization, our Vanaire engineers can install these compact Air Scrubbers on your rooftop to maximize headroom. Vanaire is an experienced designer and manufacturer of a big variety of highly effective acid scrubbers for industrial and municipal organizations. Such chemical emissions that contain sulfur dioxide or ammonia in manufacturing processes can cause serious damage to the equipment and harm the staff’s physical condition. 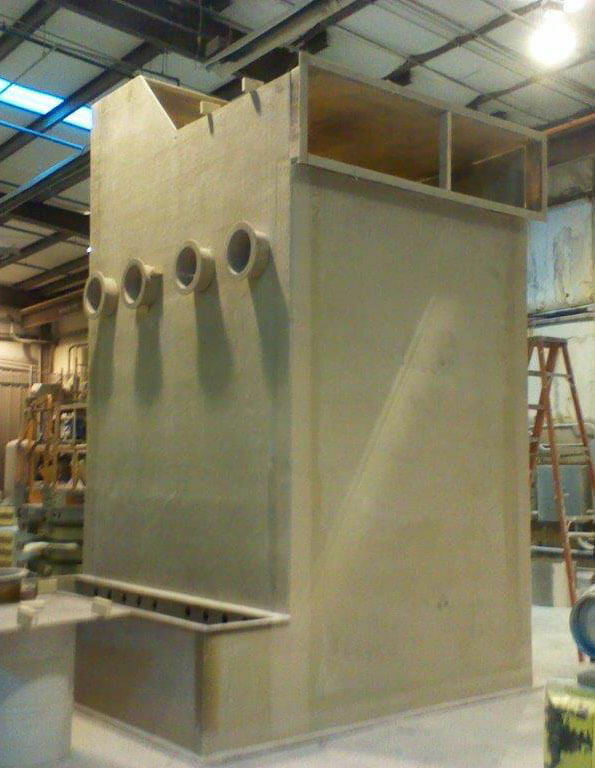 Vanaire is a leading designer, manufacturer and installer of custom built fiberglass reinforced plastic air scrubbers for industrial and municipal organizations. Our company fabricates FRP fume scrubbers in a wide range of sizes, shapes and configurations depending on client’s space limitations and needs. We construct air scrubbers in accordance with the highest quality standards in the industry and guarantee exceptional performance of Vanaire applications on the client’s premises. As Vanaire has great expertise in building reliable fume scrubbers this became possible due to our usage of the best, proven materials. Polyvinyl chloride plastic that we actively use in our manufacture enables building endurable, corrosion resistant fume scrubbers.